Welcome to the Hotel Villa Margherita Video Tour where the luxury 4 star hotel accommodation on offer in the heart of the Veneto region near to Venice and Padova can be viewed via high definition streamed videos, just sit back and enjoy the tour. Visit our Hotel Villa Margherita Photo Gallery to see further images of the luxury 4 star hotel rooms in Mira Porte on the beautiful Brenta Riviera between Venice and Padova. 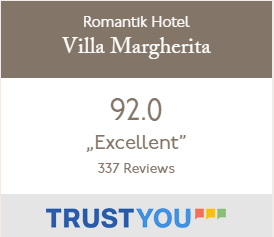 Take advantage of the best prices on the best 4 star rooms in the Veneto region with quality accommodation offered in the Brenta Riviera near Venice by booking online with the Hotel Villa Margherita Online Reservation page. Have an afternoon drink in the hotel bar which serves a wide range of drinks including local beverages. The most popular drink in the Veneto is prosecco, a bubbly that is served widely throughout Italy and finish with spritz – the classic Veneto aperitif, one part prosecco and one part soda.